Repairs to Ellis Island were immense after Sandy. The restoration amounted to more than $77 million. Hurricane Sandy crippled much of the East Coast and recovery has been slow. 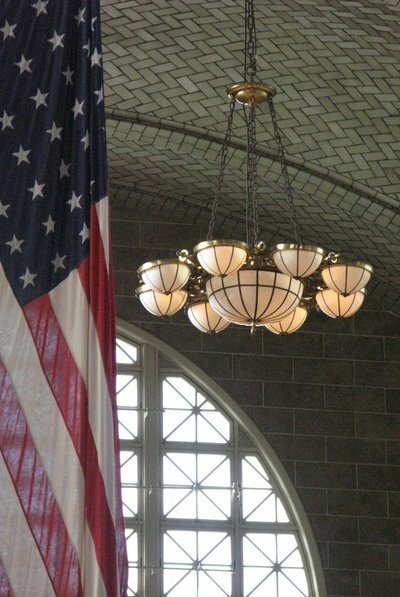 One New York landmark which has finally reopened is Ellis Island. This is the first time the immigrant museum opened to the public since the superstorm hit our shores last year. “It was just so heartwarming to see visitors step onto this island,” said David Luchsinger, the superintendent for Ellis Island, to CBS news. Luchsinger awaited the Island’s first visitors at the ferry slip. Now museum goers can once again walk the halls where doctors performed medical exams on immigrants entering the country searching for the American dream they heard about in the old country. The first person to get off the ferry and step on Ellis Island since Sandy was Cath Scheer of Riverside, California. Sandy severely damaged Ellis Island. The repairs amounted to $77 million. Water flooded the boilers and electrical systems which left the tourist attraction without power for months. Bricks were ripped off the walls, docks were damaged, and boats were thrown into the buildings from Sandy’s violent waves. The National Park Service says while Ellis Island has come a long way, there is still work to be done. The restoration is slated to be completed in May 2014. Island officials purposely chose to reopen Ellis Island on October 28 because it is the 127th anniversary of the dedication of the Statue of Liberty. Subject: LongIsland.com - Your Name sent you Article details of "Ellis Island Reopens for the First Time Since Hurricane Sandy"